A delicious and moist lemon cake with a gooey filled center – lemon pie filling. This recipe requires minimal ingredients, is quick to make, and sure to be a hit! The combination of a lemon bar, lemon cake, and a lemon pie all in one bar. These bars are one of the simplest desserts ever. Like 5-ingredients easy! And yet, with the taste, people will think you slaved over these bars for hours. They don’t even come close to tasting like they started with a lemon cake mix. And it’s impossible to tell you didn’t spend hours making a homemade gooey lemon filling, because well, it’s just plain perfect. LOVE when that happens! If you choose to add the frosting, there are a few more ingredients, but again, that is super easy too. And totally optional. These bars tasted great with and without that frosting. Now that makes for some winning dessert bars! So if you make this recipe, what will you be getting? Well for one, the praise and adoration of anyone that gets to consume said bars. But for two, you will get a burst of tangy-tart lemon flavor that has slightly been subdued by the moist cake layer. These bars are light, refreshing, and zesty. The center part of these bars is a can of lemon pie filling. It is sugary, gooey, and practically oozes out of these bars. I know. Amazing. The cream cheese frosting adds some heightened sweetness and makes the bars look even prettier. I whip up a very quick homemade cream cheese frosting, but the frosting from the tub would work great as well! These bars start with a lemon cake mix that has eggs, butter, and vanilla mixed in. Half of the mix goes on the bottom of the pan and the lemon pie filling is spooned on top. The remaining cake mix gets spooned on in dollups over the pie filling and then baked. I used a cookie scoop to scoop the batter over the filling evenly throughout the bars. Bake the bars, let em cool, and cut them into large squares. Once the bars are completely cooled, the cream cheese frosting gets whipped up and then can be piped or spread on the lemon bars if desired. And then perfect lemon goodness awaits! Preheat the oven to 350 degrees F. Spray a 9 x 13 pan with nonstick spray and set aside. Stir together the lemon cake mix, eggs, butter, and vanilla extract until completely combined. Spread a little over half of the prepared mix on the bottom of the pan - the mix just has to cover the pan. Spoon the entire can of lemon pie filling evenly over the cake mix. Using a cookie scoop or spoon, dollup small amounts of the remaining batter evenly over top of the pie filling. Bake for 32-35 minutes or until golden brown on top or until a fork inserted into the top of the cake mix (not the center filling) comes out clean. Allow to cool completely and then cut the bars into large squares. Fill a frosting bag fitted with a #3 tip (or a plastic bag and cut off the tip) with frosting and pipe the frosting on to the bars. Alternatively you can spread the frosting on the bars with a knife. These look delicious!! And I just have to say how excited I am to see that your cookie sheet looks like mine! Burnt, etc lol. Haha very burnt 🙂 It adds character to the tray I think 🙂 Thanks Jaime! GAH! Lemon pie is my fav. Cream cheese frosting is my bread and butter. Not really…but I WISH it was. I love how you turned pie into a bar. Pinning…happy weekend girlfriend! I love these lemon pie bars, Chelsea! Especially the cream cheese frosting, yum! And the fact that it’s so easy to make, too. Pinned! It’s pretty awesome that there aren’t many ingredients in this lemon pie bar!! I would totally opt for the cream cheese frosting for sure 😀 Lemon bars are a necessity for summer in my book. I’m all about that tangy-tart flavor you described! Thanks for sharing, Cheslea! Have a fabulous weekend! Yum! 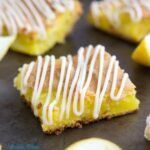 Love lemon bars, and with a cream cheese glaze those guys look like heaven in bar form! This lemon pie bar recipe would be a perfect new recipe for me to try! You know I’m in love with these!! Pinned! I can’t wait to make your Strawberry-Lemonade Cheesecake Cookies!!! Oh, these sound so lemony, summery, and refreshing! I love lemon bars, and you know I love cake and frosting, so I’m dying to try one of these! Great idea to combine them all together. 🙂 Love the lines of frosting on top too. Pinning! These are so pretty! Love all the layers! Yummo lemon. I love lemon lately. Lovin’this. Thanks for helping me celebrate Chelsea! i love the cream cheese topping. yum! these bars look pretty terrific, but i would also like to try the sugar cookie bar with a white chocolate topping. i’ve always wanted to make sugar cookie bars, and the white chocolate topping looks great! Lemon pie? In bar form? I’m sold. These look so delicious, my friend! Thank you for sharing such a beautiful and simple recipe! These bars looks delicious! They are so much easier to eat than pie!! YUM! These bars look so summery and delicious! And I love how easy they are – can’t beat that!! 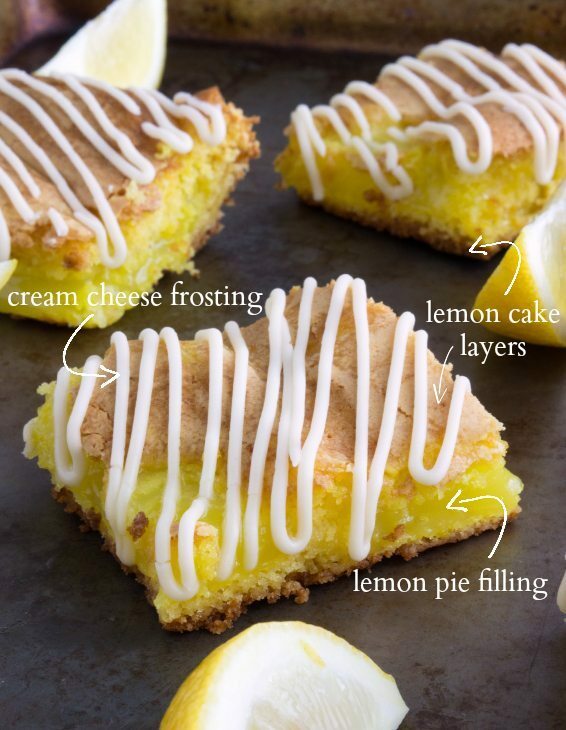 I totally want to try the Lemon Pie Bars. I love lemon and I love cream cheese frosting. Oh and Strawberry Lemonade Cheesecake cookies…yum!! Want to try the thin mint shake recipe! My wife is a HUGE fan of lemon flavored anything. I’m pretty sure I would score some major husband points if I make these for her… hmmm, should I? Hahaha of course 🙂 Pinning so I remember to make these gems! The strawberry skillet roll cake looks great! I have about 800 pounds of rhubarb to use up so I may sneak some of that in there!! 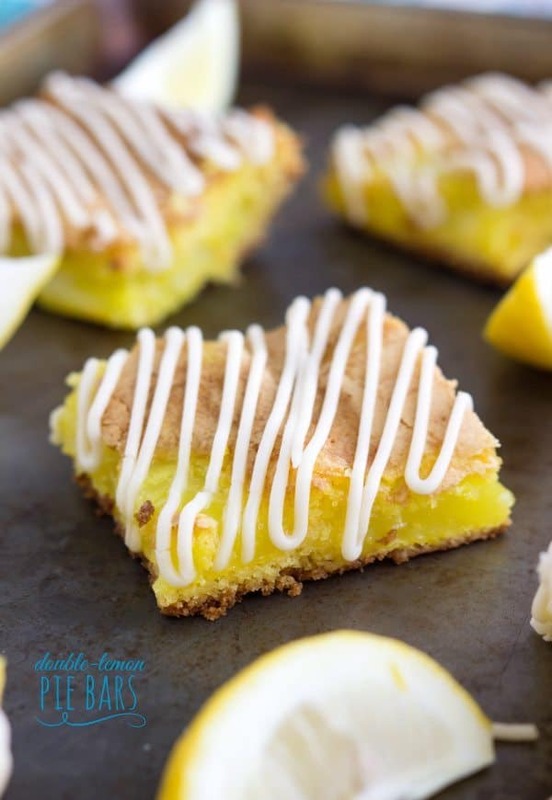 i’d love to try these lemon pie bars! yum! Your cookies and cream ice cream bars look amazing! I’ll have to try those. There are so many recipes on your blog I want to try! I think the next one I’ll get to is the Tropical Quinoa Salad with Tangy Citrus Dressing. That’s a gorgeous salad! I’ve got to say, while this recipe for lemon bars looks delicious, I think I’ll be trying the recipe for double chocolate breakfast cookies next. Chocolate for breakfast? Sign me up! These recipes look so yummy!! Can’t wait to try the lemon pie bars!!! I am such a die hard lemon fan. 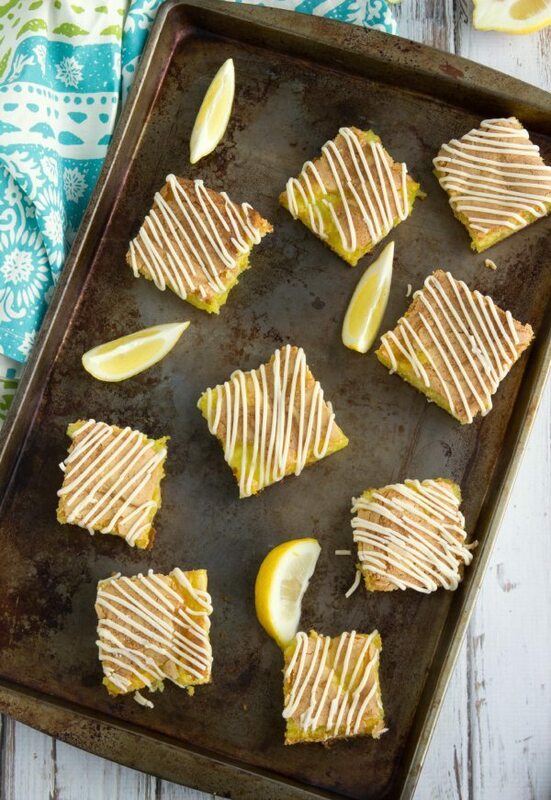 My mouth is watering over these lemon bars. Heck, I could literally eat the lemon pie filling straight from the can. I need to make these but for a pitch in so the entire batch does not stay at my house…no self control. Love the way you photographed these with the lemon wedges! Super cute! 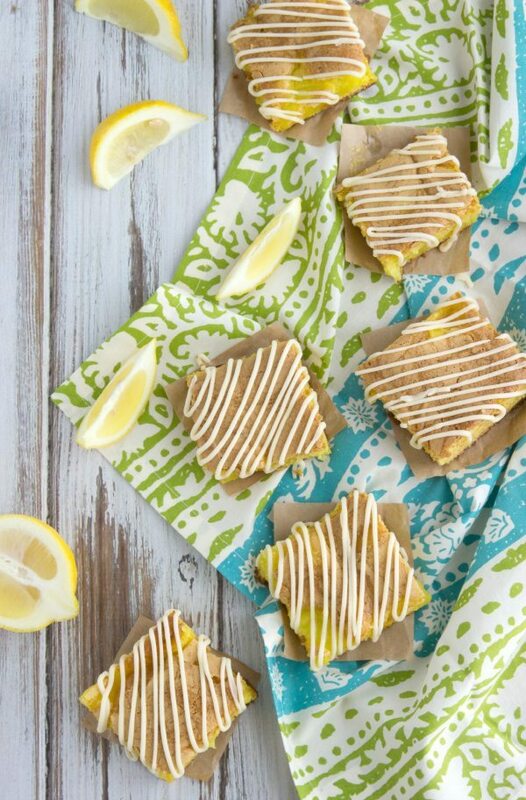 lemon is my all-time favorite flavor… and these look amazing and so easy to make! These lemon bars and your PESTO PASTA & TORTELLINI SALAD recipe both look like they’d be delicious recipes to try. Chelsea , I’m wondering what you think about adding lemoncello & lemon extract , or lemon sweet preserve to a vanilla supreme cake mix, I’m very allergic to artificial dye. Ive changed ingredients in recipes to natural out of need. Any ideas? Hi Lori! You know, I haven’t tried either ever, but I don’t see why those wouldn’t work! I would try lemon extract or even some fresh lemon juice and maybe a little bit of fresh lemon zest. Are you able to have the lemon pie filling?